I just ordered my yarn to make a Lavender and Black pair of the Double Knit Slippers. But, when I was thinking about the color my thoughts went to an Iris, instead of a rose. Hummmmmmm…….? Here we go again! So this time I used my “table tool” in Publisher, 20 rows and 24 columns. I clicked on each cell, then hit the line option button and selected,”hair line.” Once I had all my cells outlined, I saved it as “blank for charts,” etc.” Next, I took a picture of an Iris, enlarged it, put it in the “back layer” behind my grid, and started pointing and clicking the grey I had selected into the appropriate cells. Here is the results. Once done, I was inspired to do a few more. Feel free to up load and use them as you like. I had great fun making them. 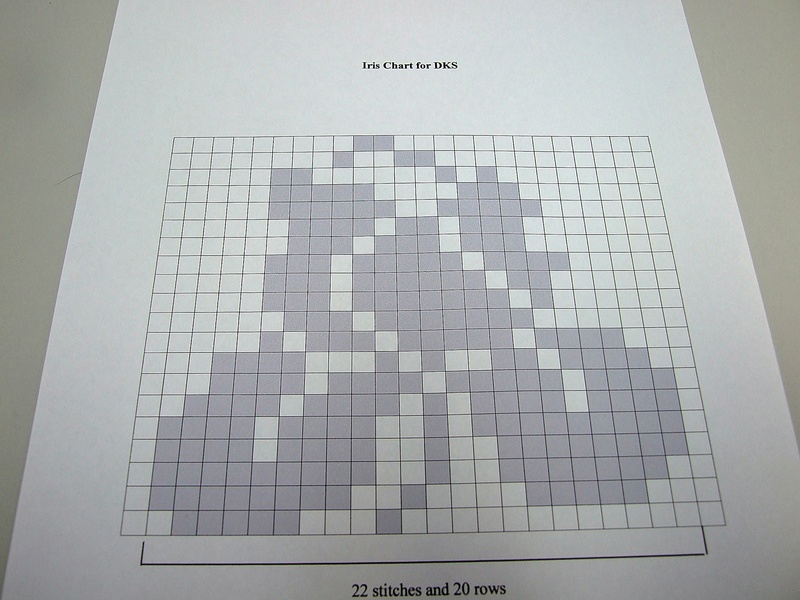 I will also upload them to my Free Charts and Patterns page so that you can access them later at your convenience. All these charts were designed with the toe area in mind, although you could use them in the cuff or leg area as well. I was messing around with a swatch the other day and decided I would practice the Invisible Bind Off technique. During the process I took some pictures and thought I would share them, hoping that maybe they would encourage someone to try it. I am sure this has been around for eons, but I learned this method from a book entitled “Essential Techniques for Serious Knitters,” by Peg Arnoldussen, a book that contains many wonderful tips and techniques. Check it out! Why the Invisible Bind Off? First off, on the plus side, it looks very neat and professional, it stretches well, and it provides my socks with a tube through which I can run elastic, if I choose. On the minus side, it takes a bit of practice to get the tension right. It requires a bit more time and planning. 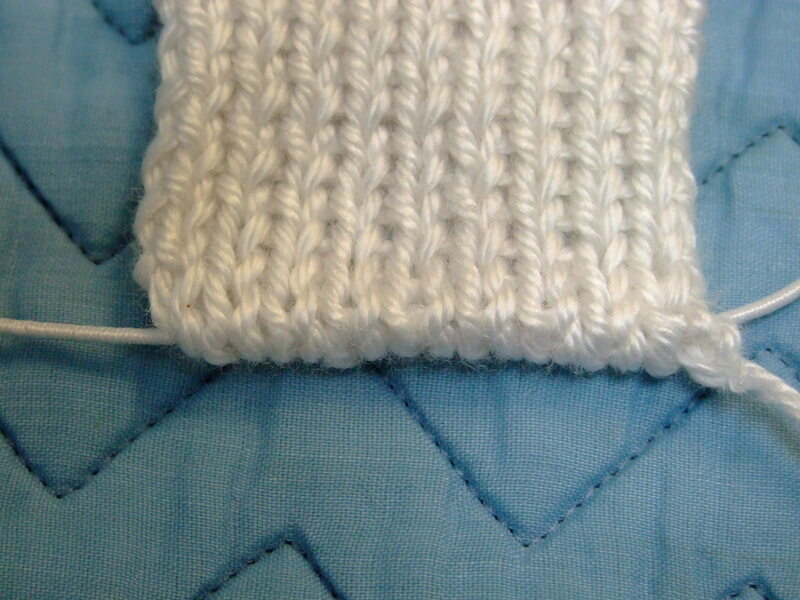 It also requires learning the Kitchener Stitch. Yikes!!!!! Why am I doing this tutorial? It helped me think through the process, and hopefully it will help you, too. I purposely did this tutorial using a small practice swatch. I also used different colored yarns so that you could see the process better. At least, I hope you can. I have knitted many of these practice swatches, but once I got the hang of it, I was never afraid to use the Kitchener Stitch for any closure. Once you get it, you get it!!! I recently received an email from a lady that was a bit confused with my explanation of what a SPR is-my term, of course. So being one that believes that you can always improve things, I took a look at the picture on page 3. When I pondered on it a bit, I realized that it was the horizontal loop laying at the base of the slipped stitch from the previous row that I actually lift onto the right hand needle to be knitted. I decided not to change the term SPR, but, I put a more clear explanation of the process in the chart key and replaced the illustration. Here is the new picture. 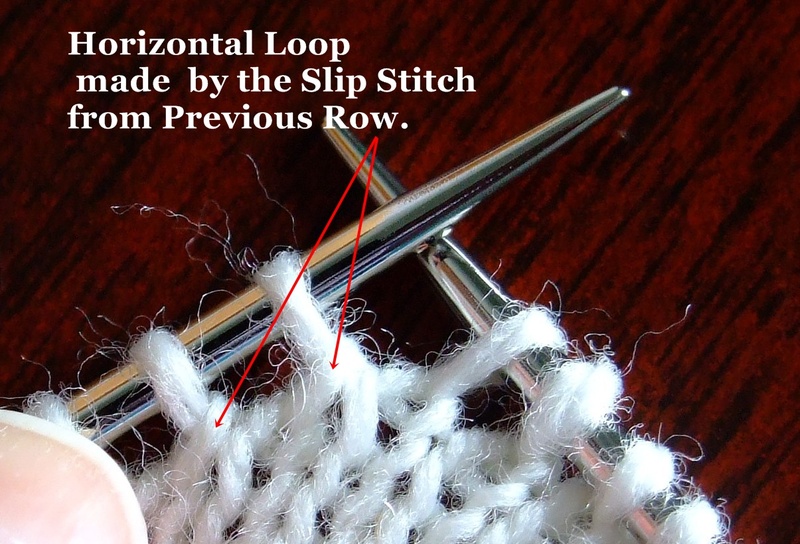 This loop is made, when the purl or knit at the end of the row is forced to the left, or in the direction your are knitting, when you slip the first stitch after the turn. The “loop” is what forms the gaps. I hope this clears things up. Who knows, I might even come up with a better illustration in the future. If I do I will post it.